Panache Dance Studio, formerly the Kay Cranwell School of Ballet, has been teaching children of the Blackwood area and surrounds the joy of dance for over 50 years. 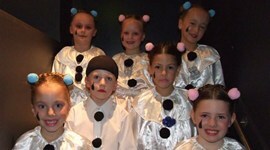 Panache is renowned for quality dance tuition & its caring attitude towards all students. Former students have gone on to dance professionally interstate and overseas. Some are now also employed by Panache to pass on their expertise to the next generation of Panache dancers. Panache Dance Studio is proud of the wonderful team of teachers brought together with the aim of teaching quality dance to all students. Click the below link for information about our staff.